ONE day after the day (11 April) in 1947 that Jack Roosevelt "Jackie" Robinson broke the color barrier in then modern baseball and three days before Jackie Robinson Day (15 April) in Major League Baseball, “42” arrives in U.S. movie theaters. 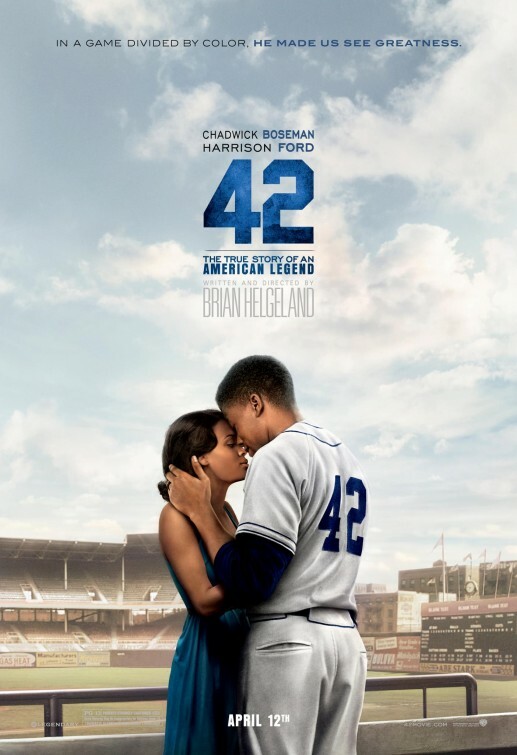 The film stars Chadwick Boseman as the slugger and Harrison Ford as the man who recruited him, Brooklyn Dodgers general manager Branch Rickey. It purports to tell the life story of JR. (See video above). Actually, “42” mostly tells the story of the baptism by fire that JR endured in the name of what was civilized, right and decent. No doubt, many baseball fans, and perhaps sports fans in general, will see the film. It is hoped, however, that people of color (non-Europeans) – particularly those who arrived in this country after Jim Crow and overt discrimination in every facet of American life were outlawed – will have a look. “42” can be a mind-altering history lesson where a disturbing gap in knowledge exists. Living in New York City, one commonly encounters people from all over the world who make Gotham their home. In fact, sometimes it is difficult to get simple directions because most of the people on the street do not have a firm enough grasp of English to offer assistance. Incidentally, this isn’t a screed against new immigrants or immigration in general. The United States is a nation of immigrants. Unfortunately, some folk seem to forget this in their determination to deport as many darker-hued mainly Spanish-speaking people as possible, the distorted faces of illegal immigration in the United States. 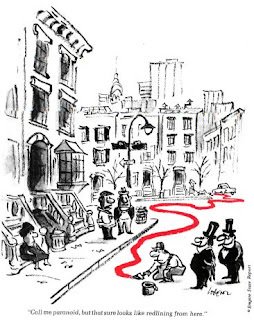 The point is that the world lives in New York City. Much of this world arrived on these shores long after overt institutional discrimination, the sort that “42” provides a glimpse of, was outlawed. Many of these newcomers have not a clue about the struggles of black Americans. Too often, they only know what they see: black Americans are a societal scourge. To the minds of many of these people – who’ve emigrated from Africa, Asia, Caribbean, Europe, Middle East – Black Americans are the poorest, the sickest, the dumbest, the most criminal and on and on. The worst of the worst. Of course, they get most of their information about black Americans from entertainment and media. Those who get firsthand accounts are mainly poor. They can only afford to live where poor people, including poor black people, live. Poverty ain’t pretty, and they have been witness to some pretty ugly behavior. They do not live among most black Americans, people who are working-class, middle-income, upper-income and wealthy and who are less likely to engage in the ugly behavior that has so marked us as bad people. Rarely do our friends pause in their rush to judgment to challenge themselves to suss out what would cause people to act like animals, the preferred keyword when describing the bad behavior of black folk. 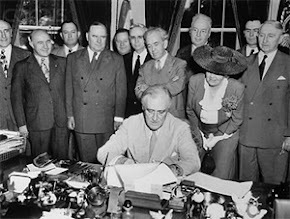 When President Franklin D. Roosevelt signed the G.I. Bill of Rights, life improved for a lot of Americans, but not all. Photo courtesy of the Libary of Congress. What “42” does to some extent is provide insight into the effects that crippling institutional discrimination and racism have had on a people, a people that built this country, incidentally. “42” has the potential to do far more educating and enlightening than any lecture on Redlining, U.S. Slavery, Reconstruction, Jim Crow and the Civil Rights Movement. The film can illustrate to these newcomers, particularly those from the Caribbean, the sacrifices that black Americans have made; the horrors and terrorism they suffered to make this country a far more livable place for people like them and all newcomers of color. Do A-Rod, Sammy Sosa and all of those Major League Baseball players from places such as Puerto Rico and the Dominican Republic understand that if it were not for Jackie Robinson or some other black man, they would not be playing in the league? One wonders. This baseball film can do in two hours what a million lectures on the discriminatory nature of the GI Bill and FHA (Federal Housing Administration) cannot. Such programs as these helped people who at the time were only marginally white, like Italian Americans and Irish Americans, out of poverty. These Great Society program were the bootstrap that so-called white Americans used to pull themselves up. They were given low- and/or no-interest loans to pursue education, buy property, start small businesses, to keep a farm going and so on. Through these programs, they were able to build equity and a little wealth that they could pass along to future generations. Overwhelmingly, black Americans couldn’t avail themselves of these programs for no other reason than that they were black. Period. Most newcomers (and frankly, old heads) to this country who have such disdain for black Americans have no knowledge of this ugly side of the GI Bill and the FHA. Nor have they heard of Tulsa, Oklahoma’s Black Wall Street or any of the other black business districts that thrived in the early 20th century. They are ignorant of the Tulsa Race Riot of 1921. 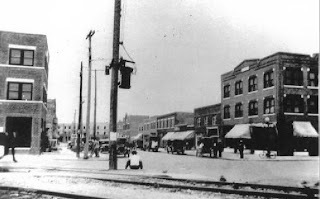 In fact, very few people in general know that during this tragic episode poor and working class whites destroyed this booming community in Oklahoma out of envy and spite. Of course, “42” does not address these events. 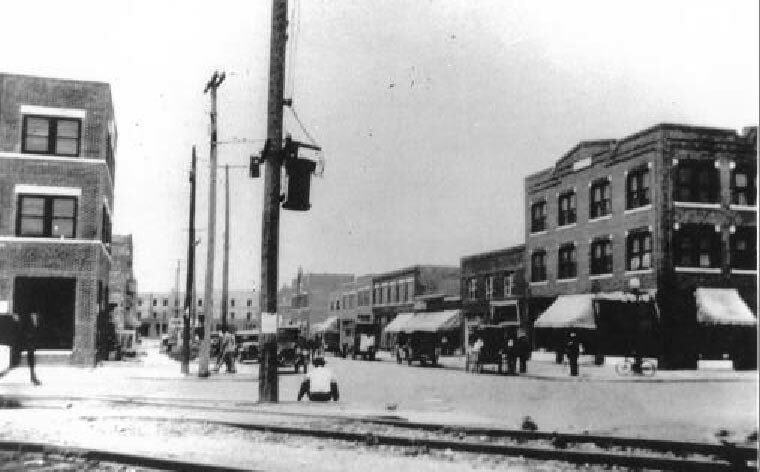 Tulsa, Oklahoma's Greenwood Avenue was "The Street" back in the day. Photo courtesy of the Beryl Ford collection. The film does, however, pack enough historical punch to at the very least cause well-meaning people, particularly those from the African Diaspora, to start to rethink their negative attitudes toward black Americans. To realize that people of all groups will behave badly, and there is no good excuse for bad behavior. But more important to understand the hardships that black Americans, through no fault of their own, have endured in this great country. Hardships that now allow newcomers like themselves a far greater measure of comfort, opportunity and freedom. On this point alone, “42” scores a homerun.